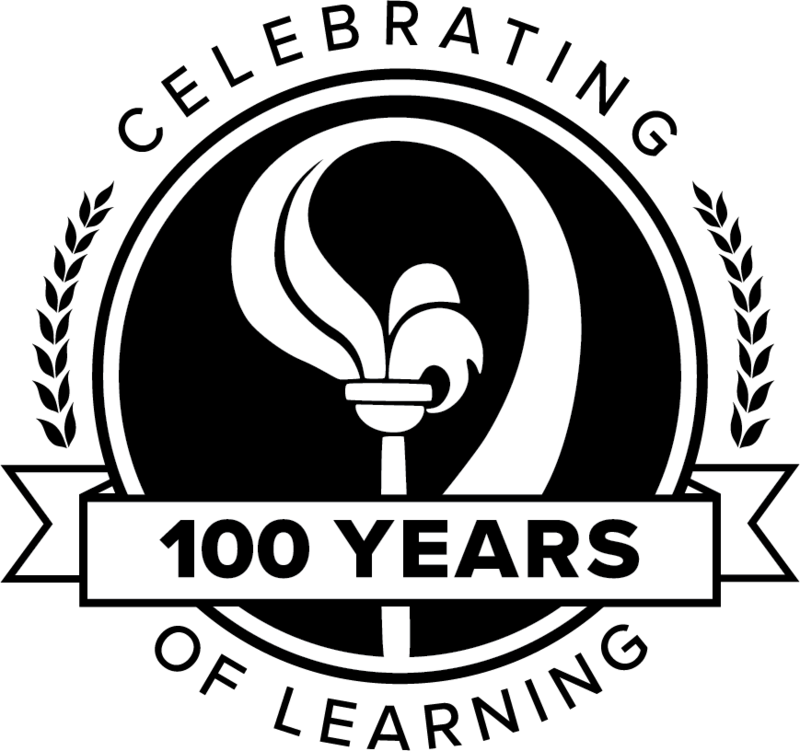 In 2019, Open School BC will commemorate a century of work in distributed learning with a year-long online celebration. Founded in 1919 as the B.C. Elementary Correspondence School, we first offered printed courses to students in rural settings. 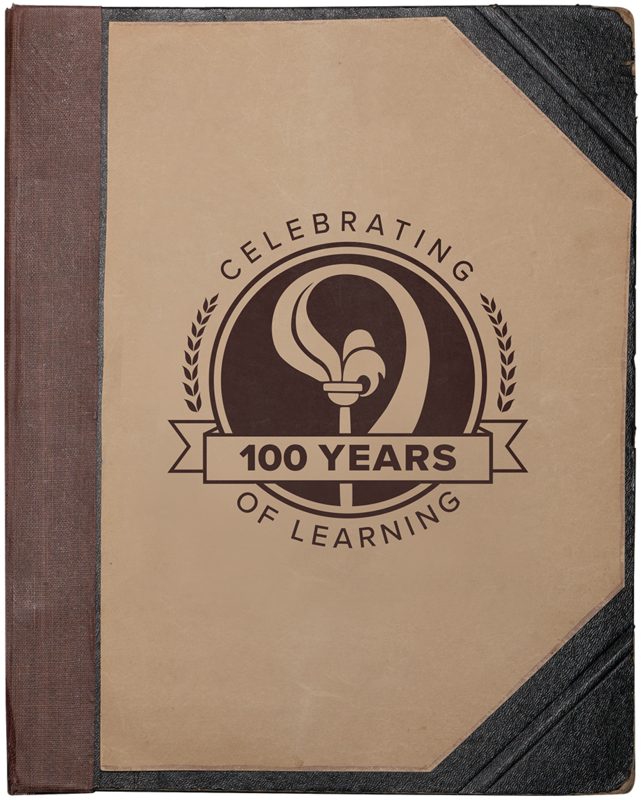 100 years later, we offer online courses, educational services and resources for both public and independent schools, as well as the public sector. The delivery of educational materials may have changed dramatically, but the goal is still the same: supporting learners and teachers with high-quality resources. We were able to track down lots of information about Open School BC’s first century, but we know there are more stories waiting to be told. If you have a story, image or other memory about Open School BC to share for this project, please let us know. We’d love to hear from you! Navigate the timeline by using the left and right arrows on your keyboard, or by clicking on a date. "Your proposal, namely, to carry on the education of children in remote country districts unprovided with a school through a system of correspondence cannot, I am afraid, prove successful… Constant supervision by a teacher is necessary if progress is to be made by pupils who have never before attended school." Spetch was undeterred and repeated his request in April. In May 1919, his persistence paid off; he received the positive response he was looking for: his children would receive a formal education by correspondence, supervised by the Department of Education, which offered a similar course for coal miners. 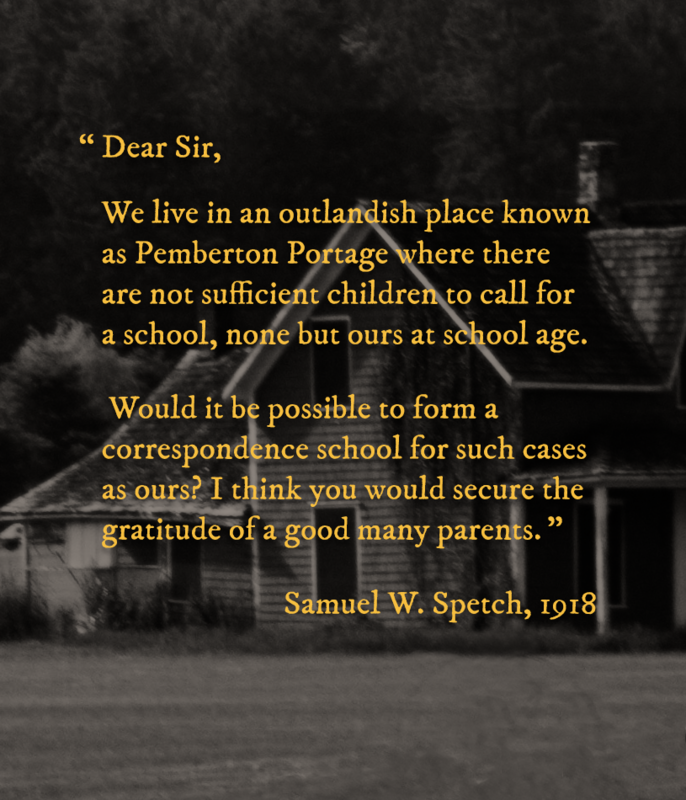 December 30, 1918: Samuel W. Spetch sends a letter to BC Premier John Oliver requesting correspondence education for his three children. 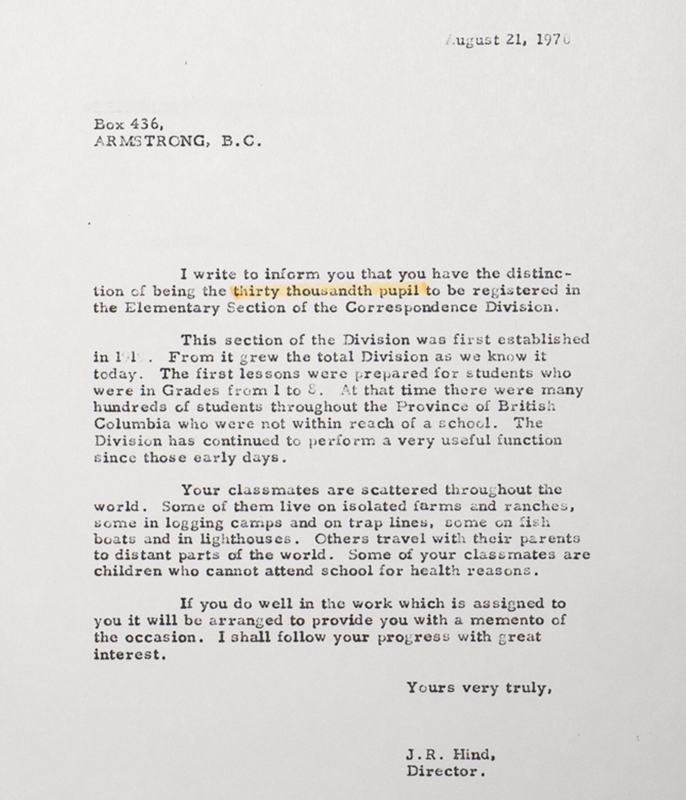 May 13, 1919: After two refusals, Spetch receives a letter with the news that British Columbia will provide an education for his children and others in remote areas. 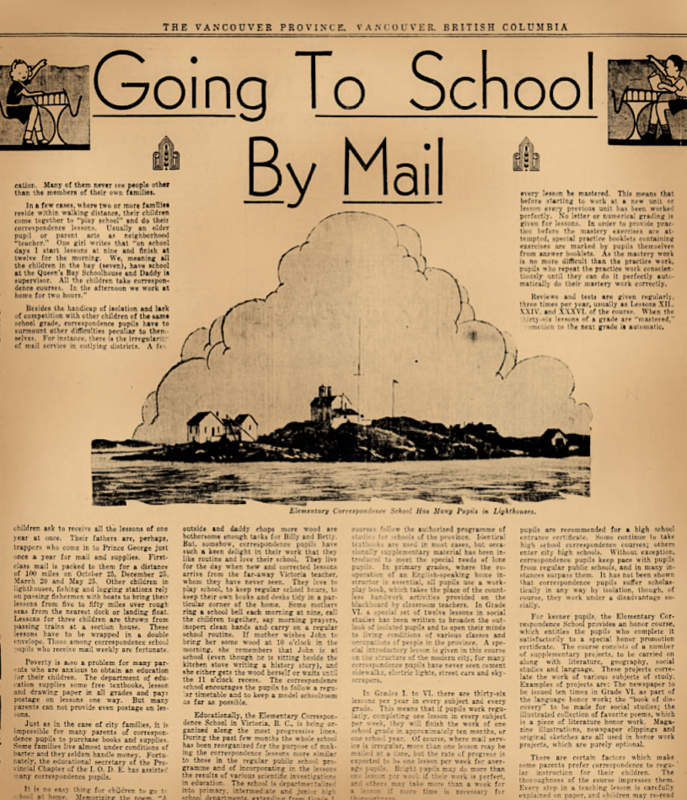 May 23, 1919: The first correspondence courses are mailed out. September 1919: 86 students, including 13 children of lighthouse keepers, are enrolled in the correspondence program. For the first decade of its existence, B.C. 's Elementary Correspondence School was housed within the province's Technical Education Branch. In 1929, it became its own branch within the Ministry of Education, and was providing courses to more than 600 pupils. That same year, high school correspondence courses were offered for the first time, starting with 700 instructional papers in 35 subjects. The public demand for these courses exceeded expectations, with nearly 600 students in the first year and a doubling of enrolment for its second academic year. 1927: James Hargreaves became the first Officer in Charge of Correspondence Courses. Hargreaves was the instructor in charge of coal mining courses who wrote back to Spetch with the first course information. 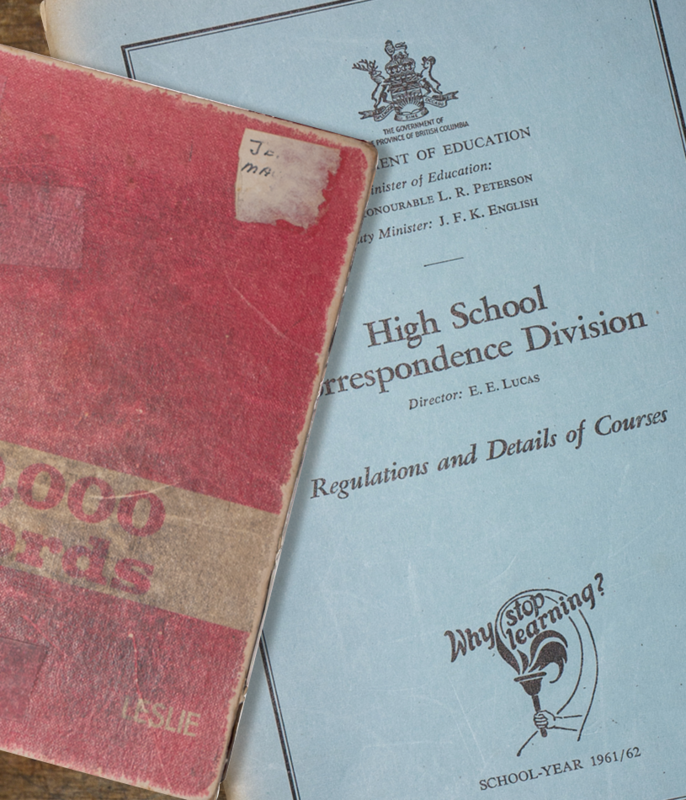 September 1929: First students enrolled in High School correspondence courses. 1929: Launched School Days magazine, sent monthly to ECS pupils. 1929: Amendment to the Public School Act allowed Elementary School Correspondence to become a separate branch of the Education Department. As Canada weathered the Great Depression in the early 1930s, the B.C. Correspondence School helped offer courses free of charge to unemployed men living in relief camps. Hundreds of unemployed men took elementary, high school and vocational courses. While the completion numbers were difficult to track, Automotive Engineering and Geology were popular courses, as were English and Arithmetic at the elementary level. 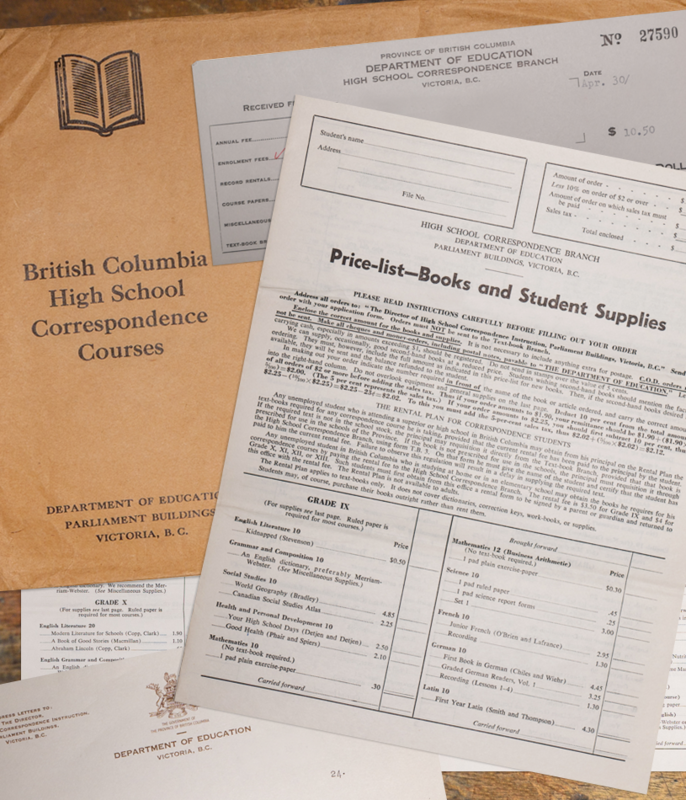 In August 1938, the first International Conference on Correspondence Education was held in Victoria, B.C. British Columbia was chosen as the conference site for its pioneering of correspondence education, which was predated only by New South Wales, Australia, whose system started three years prior. 1931-1932: Students attending small high schools were first permitted to take by correspondence one or two optional courses not offered at the school, thus allowing for enrichment of their studies. November 1934: Article by Isabel Bescoby (Director, ECS) about children of lighthouse keepers appears in the Province newspaper. August 1938: First International Conference on Correspondence Education held in Victoria. 1939-1940: The High School Correspondence School (Grades 9 - 12) became a fully accredited high school, eligible to recommend promotion of students without examination. In September 1941, a satellite branch office was set up at Pouce Coupe to look after all elementary correspondence students in the Peace River area. The major transportation links and mail service for the Peace River area went through Alberta, causing long delays waiting for assignments to arrive from Victoria. The satellite office had 79 students enrolled by June 1942. 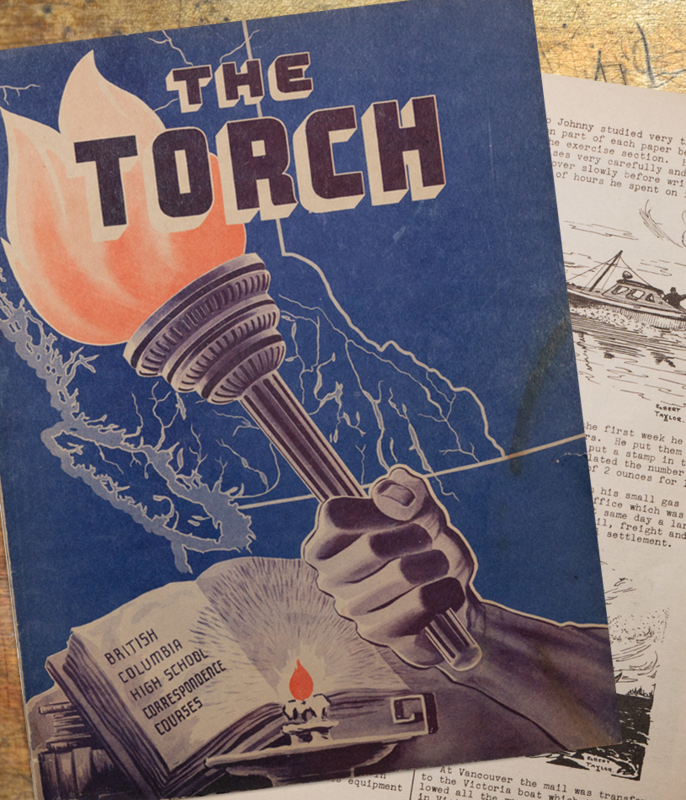 The first issue of the High School Correspondence Branch's magazine, The Torch, was sent out to students in 1942. Filled with drawings, stories and letters from students, as well as instructor profiles and essays, the magazine served as a way to connect the correspondence community across the great distances it represented. 1941: The first Elementary Correspondence School satellite branch opened in the Peace River area. 1942: Interned Japanese students enrolled in correspondence courses. 1942-1943: The Torch magazine was first sent out to High School pupils. 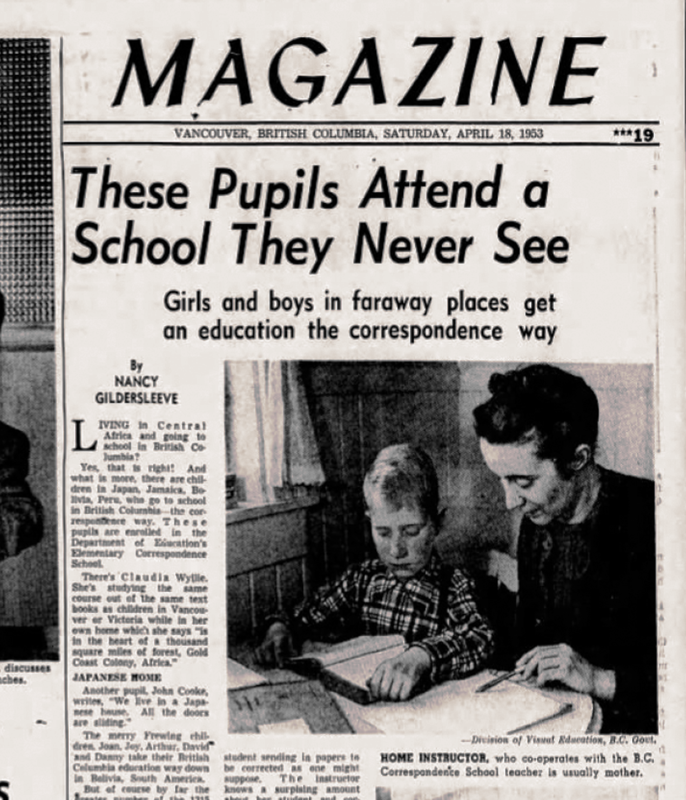 1948-1949: The High School offered English courses to help the new immigrants of British Columbia. After World War II, Canada welcomed many new immigrants. Demand for adult English language education increased, and the secondary correspondence division created two non-credit courses in English and Citizenship. Thousands of copies of English for New Canadians I and II were sent out to night school teachers, neighbours and church volunteers who were helping with language instruction. This decade also saw the extension of correspondence education to the other end of the age spectrum, with the first Kindergarten-level program for pre-school training of 5-year-olds. 1955-56: First Kindergarten course and kit created. The 1960s were a busy decade in the correspondence branch, with big projects and organizational changes. In 1960-61, Dr. Edith E. Lucas, the High School Correspondence Branch's director, helped to set up a correspondence program in Jamaica for the British West Indies Federation. While she was away, Assistant Director (and former correspondence student) Dennis Kershaw ran the branch. For Canada's centennial in 1967, a special celebratory course called The Realm of Canada was offered by the Secondary Correspondence Branch. The decade ended with the 1969 amalgamation of the Elementary and Secondary School branches to form a single Correspondence Education Division within the Ministry of Education. November 1967: Provincial correspondence branch directors from 5 provinces meet in Winnipeg to exchange information – the first such provincial gathering. January 1, 1969: The Elementary and Secondary Correspondence branches were combined to become the Division of Correspondence Education. In 1970, the elementary correspondence program celebrated its 30,000th pupil. Then director J.R. Hind sent the lucky student a letter to mark the occasion, promising to provide her with a memento of her special status…so long as she "does well in the work which is assigned", of course! Adults had long outnumbered children and teens in the correspondence branch courses. This changed in 1978, when the adult student population was split off from the correspondence branch though the creation of the B.C. Open Learning Institute. Its mandate was to provide adult basic and post-secondary education by distance means. The correspondence branch continued to provide distance education for children and youth. The 1970s also saw a major shift in the instructional design of the courses offered, moving from the delivery of straightforward "lessons" to a more cohesive, multimedia approach. 1973: Peace River Regional Correspondence School moves from Pouce Coupe to Dawson Creek. In 1984, the Ministry of Education ran a regional school pilot program in Fort St. John to help manage correspondence students more efficiently. After a successful trial, this model was adopted provincially, with the creation of nine Regional Correspondence Schools. The regional schools were all up and running by 1990. While the delivery function for distance education was decentralized, the development of DE courseware, funding and policy remained a part of the Ministry until 1997. In 1988, The Distance Learning Branch rebranded as the Technology and Distance Education Branch to reflect the increasing importance of the computer as a learning resource. April 1, 1988: Open Learning Institute becomes the Open Learning Agency, managing what became the BC Open University, and the Knowledge Network. After regionalization was complete, B.C. shifted its focus to offer online learning. With new telecommunications software, faster line connections, conferencing software, CD-ROM technology, and the expansion of the Internet, content could now be delivered on multiple platforms. The term "correspondence education" was supplanted by the term "distance education" to reflect this development, with the School Act adopting the same terminology in 1995. By 1996, the Ministry retained only funding, legislation, and governance functions. School boards were responsible for distributed learning program delivery. In 1997, the Technology and Distance Education Branch of the Ministry of Education was merged with three programs of the Open Learning Agency (Schools TV, the Schools Programs Group and the Adult Basic Education Group). The new division was called Open School and it worked to develop distance education products for the B.C. distance education schools and the public school system. Open School's first major project was to convert existing printed course materials into online content. OSCAR (Open School Courses and Resources) was born. It was built to take a single source of content and publish out to multiple formats. With an accompanying website and learning management system, 14 courses were online in 1999. 1993: New Directions in Distance Learning (NDDL) project was developed, allowing learners to connect electronically with teachers. NDDL used conferencing software for asynchronous academic communications, speaker phones for real time interaction, digital tablets, and internet services. The Open Learning Agency started to close down in 2002, and in 2003, the Queen's Printer acquired the Open School division. Operating as a cost-recovery organization within the provincial government, Open School BC created over 30 online K-12 courses, and evolved its online hosting system into a modern learning management system (LMS). From OSCAR to WebCT to Blackboard to Moodle, Open School BC has continued to offer enterprise-level LMS services for K-12 clients, and increasingly, to the public sector as well. In addition to producing award-winning multimedia pieces for the K-12 sector, OSBC started to work on public sector projects. 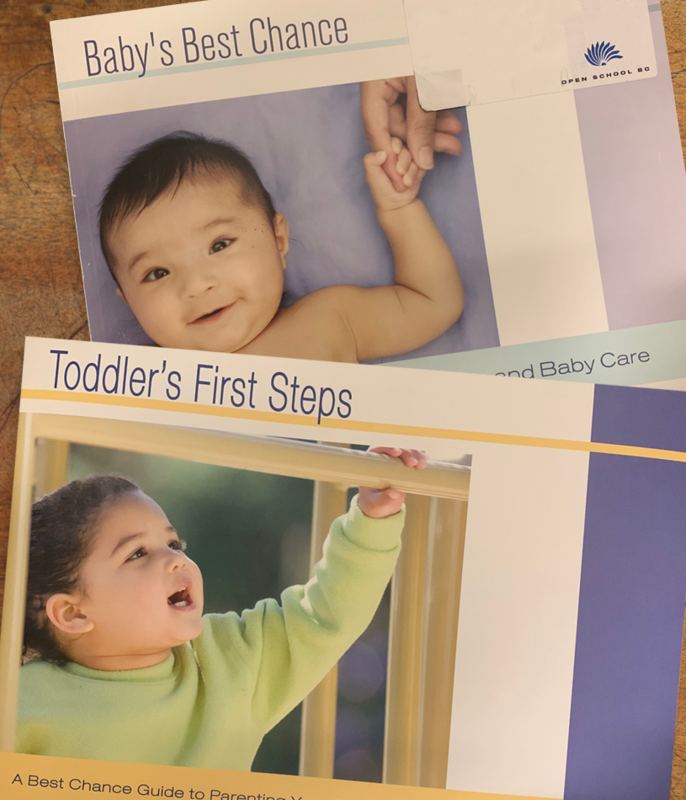 Major print projects like Baby's Best Chance and Toddler's First Steps were produced for the Ministry of Health, while online training courses such as the Freedom of Information and Protection of Privacy Act training established Open School BC as a leading e-learning developer. Province-wide, online learning continued to increase in popularity. By June 2008, there were nearly 49,000 school-age and adult students taking at least one distributed learning course from 50 public and 13 independent distributed learning schools. 2008: Started working with the Industry Training Authority (ITA), a relationship that continues a decade later. In 2010, Open School BC moved back into the Ministry of Education, physically relocating to the Ministry of Education building in 2012. As part of the Ministry, Open School BC continued to produce award-winning projects. 2016 in particular was a banner year for OSBC: winning two national awards through the Canadian Network for Innovation in Education (CNIE) for the development of learning resources. "StrongStart BC: Exploring the Reflecting on Quality Tool" won for Excellence and Innovation in the Integration of Technology in Instructional Design/Teaching & Learning, while "Bamboo Shoots: Chinese Canadian Legacies in BC" was selected in the category of Excellence and Innovation in the Integration of Technology in the K-12 Classroom. That same year, OSBC was also recognized for overall organizational excellence. In addition to regularly winning the B.C. 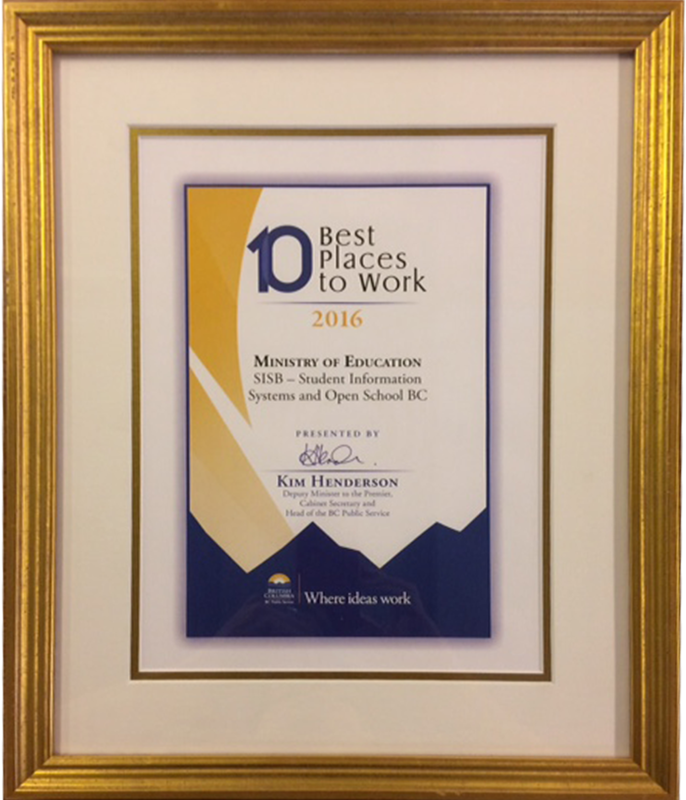 Public Service's Top Work Unit award, which is based on staff scoring, we received both a 2016 Best Places to Work in the Provincial Government award and the Premier's Award for Promoting Innovation and Excellence. Proud moments! Looking back at our history, the modern Open School BC is a result of organizational and individual resiliency and responsiveness to a changing educational landscape. While we can't predict the types of work we'll be doing 20, 50, or 100 years from now, we believe that this adaptability will continue to serve us well. No matter what the shifts in technology and changing demands from clients bring to us in the next century, OSBC's core values of service and quality will be at the centre of all we do. We will continue to help our clients find solutions that work for them, while designing and creating high quality products that meet the needs of learners. Of course, we'll always leave room for a little fun… Looking through our archives, our organizational culture of hard work, mutual support and good humour has been apparent from the very earliest days. It's this culture that keeps us going, fuels our great ideas and motivates us to bring our best every day. Check out the rest of our website to learn more about our products and services and to meet our team. 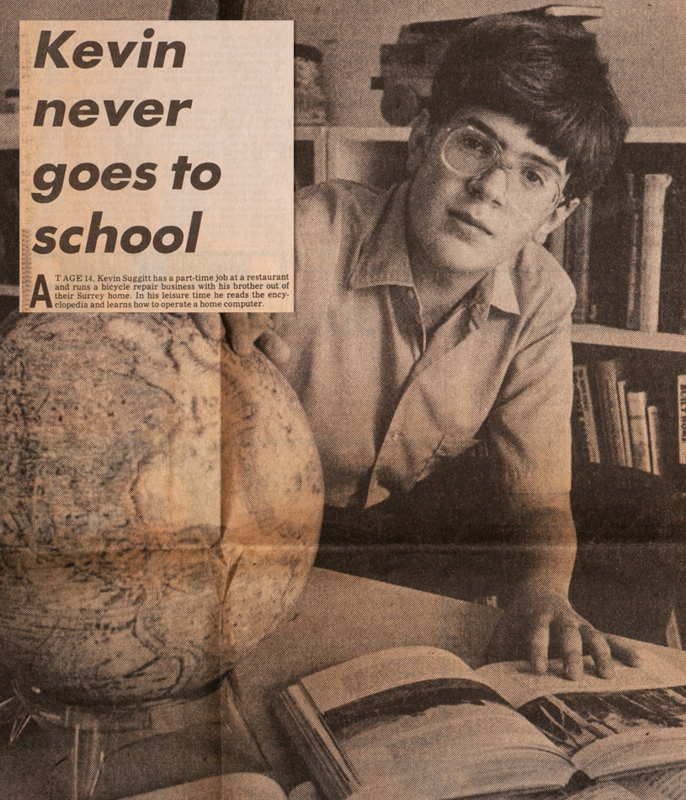 While researching Open School BC’s history, we found dozens of articles, brochures, photographs and stories that we wanted to find a way to share. While not all milestone events, these represent the smaller moments that add up to 100 years of history. The scrapbook design is a tribute to a real book that was kept by the staff of the Elementary Correspondence School for several decades, beginning in the 1930s. Its pages are filled with newspaper clippings, poetry, and correspondence, and showcase a staff culture of hard work, fun and mutual support that continues to this day. Click on the scrapbook cover to see it full-sized. Dallas, J. (1999). Distance Education For Kindergarten To Grade 12: A Canadian Perspective(Rep.). BC: Open School, Open Learning Agency. Froese, C., Harris, G., Restall, L., & Witherspoon, E. (1987). Taking the Distance Out of Distance Education: A Regionalized Approach(Rep.). Hobenshield, S. A. (1989). A History of Public Correspondence Education in British Columbia(Unpublished master's thesis). University of British Columbia. Spearing, R. L. (1990). A Brief History of the Distance Learning Branch of the British Columbia Ministry of Education(Rep.). Stack, A., & Power, D. J. (1993). Development of a New British Columbia Distance Education Program: A Case Study(Rep.). Winkelmans, T., Anderson, B., & Barbour, M. K. (2010). Distributed Learning in British Columbia: A Journey from Correspondence to Online Delivery. Journal of Open, Flexible and Distance Learning,14(1), 6-28.